Everyone likes their kitchen to be clean and for me it’s non-negotiable. With kids and pets in and out of the kitchen all the time it does get messy. I split out the things that matter to me into daily, weekly and monthly chores. Once I get into a routine it takes less and less time to complete as thing’s tend to stay pretty clean and neat. If I’m running short on time I’ll set an alarm for say 10 minutes and just do as much as I can in that time, just to keep on top of things. Here’s a list of all the chores you might want to think about including in your kitchen homekeeing schedule. Wipe down the kitchen worktops. Take out the rubbish and recycling. Vacuum and mop the floor if it’s looking grubby. Clean the hob and wipe down the oven. 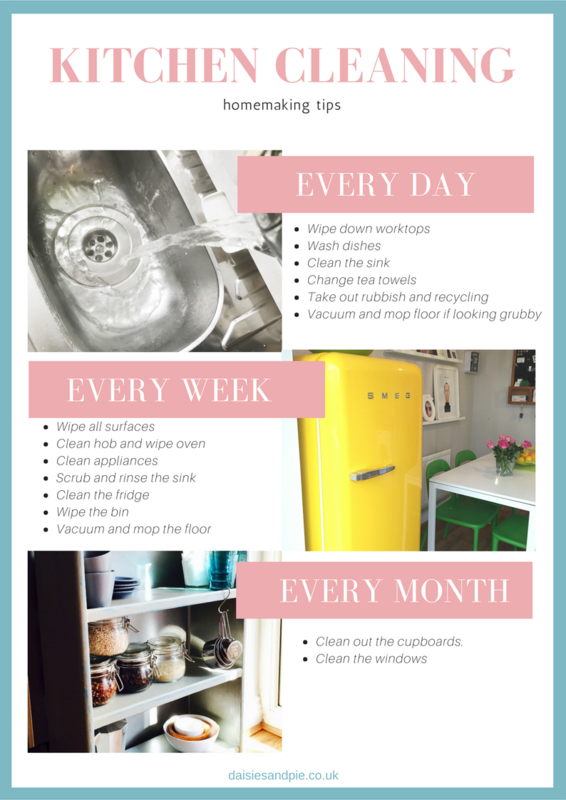 Clean all the appliances, toaster, microwave, coffee machine etc. Scrub the sink and rinse the drains through. Wipe down the kitchen bin.